Today we're excited to be taking part in the 100 Days of Play blog hop organised by Sun Scholars & Life at the Zoo. It features 100 bloggers from around the world sharing different play based activities over 100 days! 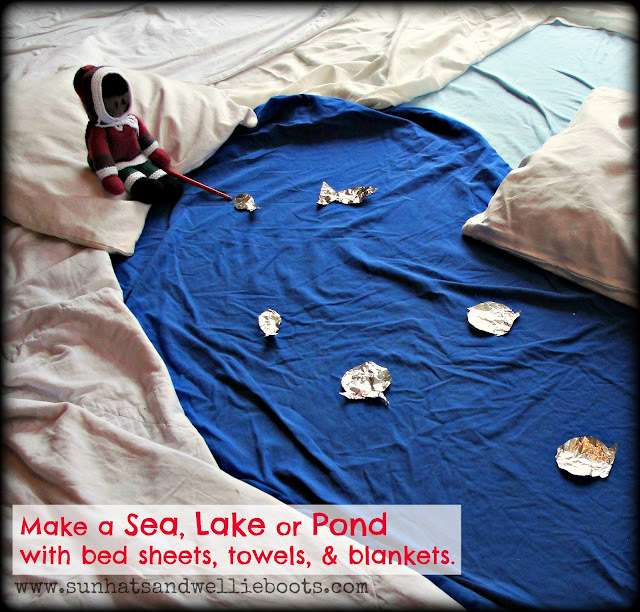 Each activity offers a simple & fun idea for you to share quality time together with your kiddos. 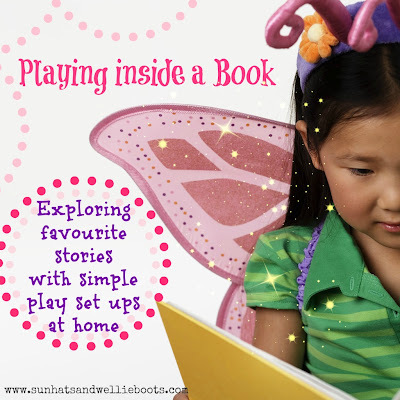 Today we're sharing one of our favourite activities - playing inside a book. Minnie loves cuddling up & sharing a story with me (I love this precious time we share too) but she also loves retelling favourite stories & acting them out. 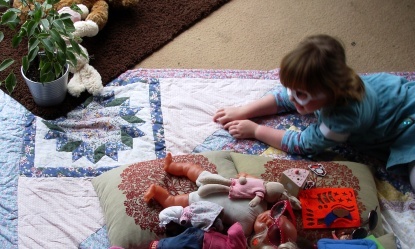 With a few props gathered from around the house we've created simple play set ups which have helped bring familiar stories to life! All you really need is a little imagination & time set aside from the daily chores & routine to enjoy this magical play time together. Playing alongside your child is a great way to observe their language, knowledge, & imagination, & of course it's great for creating special memories too. The play set ups don't have to be elaborate or take ages to put together, they just need a few items which are relevant to the story & props which will spark your child's imagination. Blankets, towels & bed sheets are fantastic for transforming every day objects (such as sofas, tables) into something completely different. 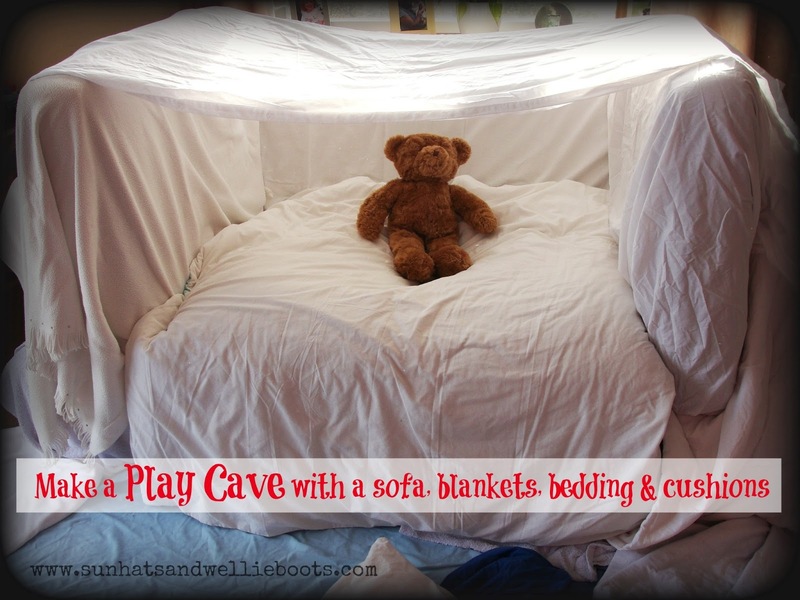 Check out our snow bear cave below, we just moved the back sofa cushions to the sides of the sofa & added sheets to create this chilly winter cave, perfect for exploring "The Bear in the Cave" by Michael Rosen or "The Ice Bear's Cave" by Mark Haddon. 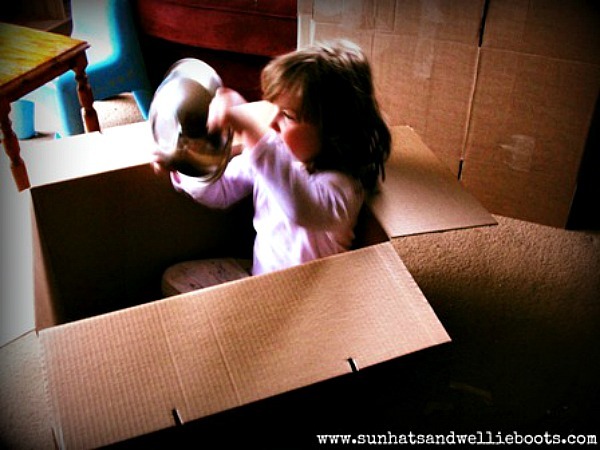 Or how about using a cardboard box to create a cave. 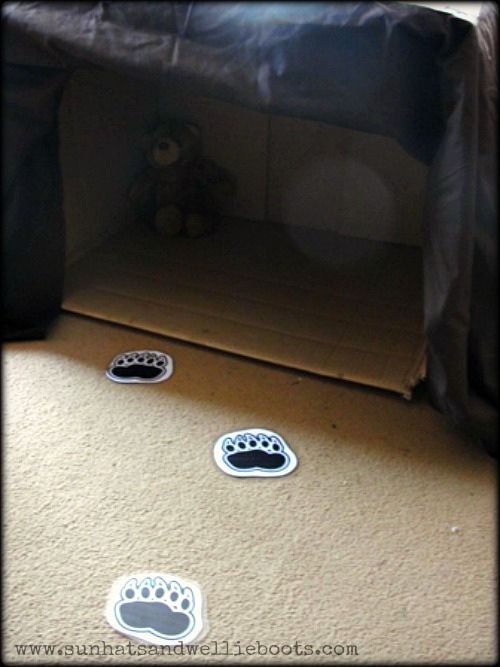 We used this one when we reenacted "We're Going on a Bear Hunt" by Michael Rosen. 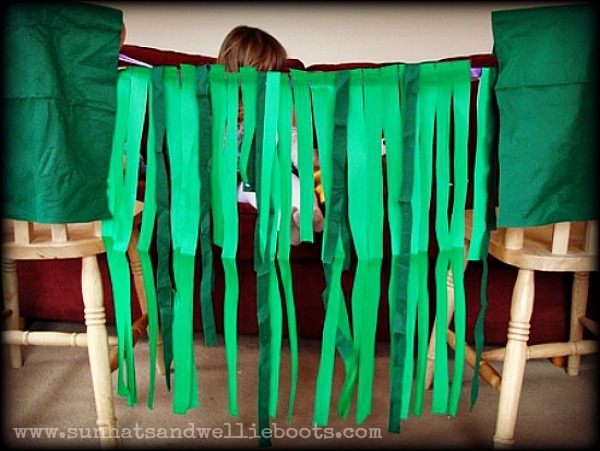 A few strips of material / paper hung over a length of string tied to a couple of chairs can transform your living room into a jungle! 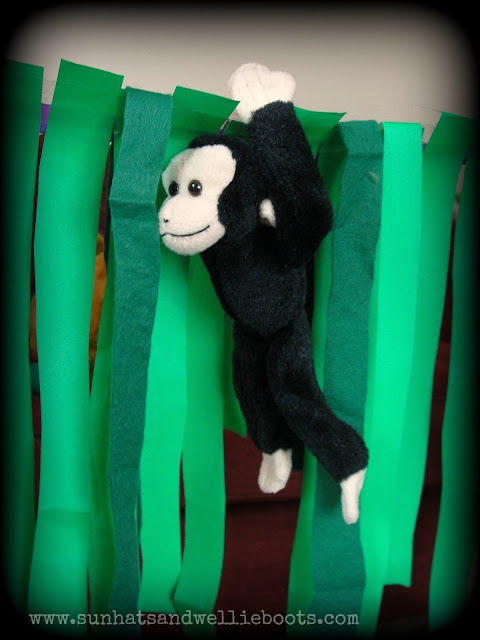 Great for playing 'peekaboo' & exploring books such as "Walking Through the Jungle" by Julie Lacome, "Rumble in the Jungle" by Giles Andreae, or "The Animal Boogie" by Debbie Harter. How about going fishing, swimming or even paddling in your own river/lake/pond or sea! Again we just spread a few bed sheets, blankets & pillows over the living room floor & suddenly we were splashing & sploshing in the water! Any underwater tale would be great to play out here. 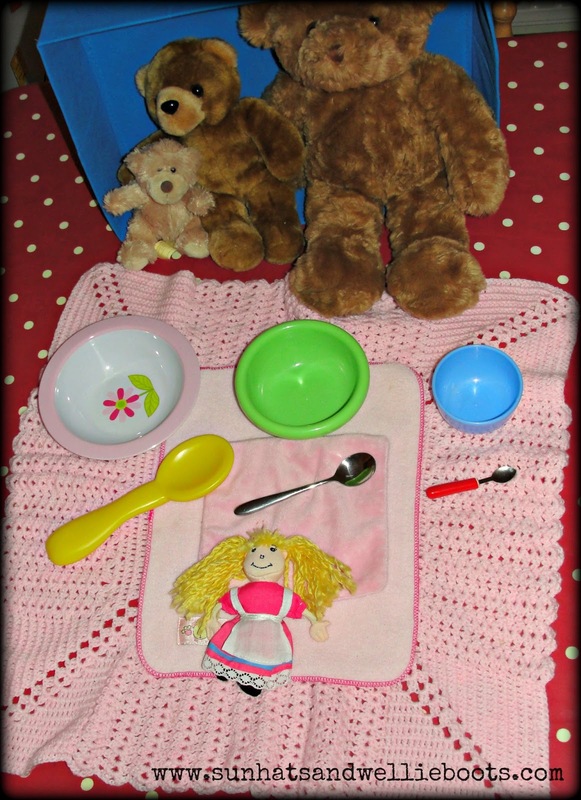 Collect a few simple props of differing sizes along with 3 teddy bears & you have a "Goldilocks & the 3 Bears" play set to share. The play set up below was put together by my 3yr old after we had read "The Snail & the Whale" by Julia Donaldson. To some it may not look like an ocean & shoreline, but this play set up had her captivated for a whole afternoon as she retold key parts of the story. Or these tp rolls used after reading "The Treasure Hunt" by Nick Butterworth. 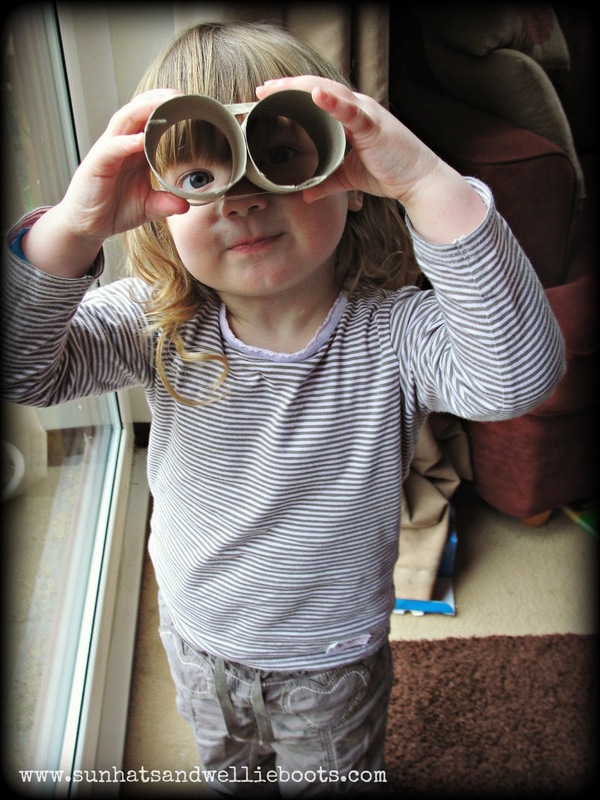 So why not check out your child's favourite book & have a hunt around the house for a few play props. Give yourself 30 mins (or more if you can) to play alongside your kiddo & play inside a storybook together. If you let your child take the lead, & listen to their thinking as they play I bet you'll discover something new about them, & you. I wonder what adventures lie ahead for you both? What characters you'll meet, or lands you'll explore together? Forget the washing, cleaning, & the humdrum for at least half an hour & escape with your little person into their world of wonder & imagination... it's well worth it. To discover the other fantastic play based activities check out the list below, & why not join in the 100 Days of Play Challenge. New ideas shared each day from 4/1 - 7/16.